We look forward to welcoming you to Hecho-a-Mano.eu. If you do not want to buy "off the peg" rings, then you've come to the right place. 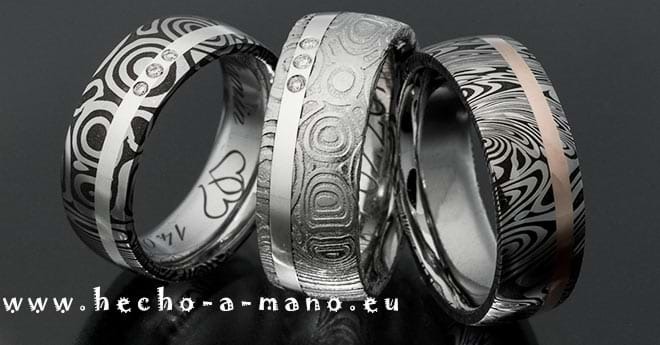 Were wedding bands made of Damascus steel many years ago still quite unknown, this has turned into the opposite nowadays due to the noble appearance of the material and its durability. As models of the PureCollection, but of course also in combination with precious metals like silver, platinum, palladium and the different gold alloys, we craft fancy wedding bands according to your size specifications especially for you. Are you looking for extraordinary wedding bands for your wedding? A wedding is very special, an unforgettable event: two people say YES to each other and make the knot. An important and visible symbol of this eternal love are wedding rings. Take your time and be inspired by our extraordinary wedding rings. As a couple you will wear the wedding rings for a lifetime and thus demonstrate your love and solidarity. Because of their durability, our Fancy wedding bands made from damascus steel are particularly suitable to accompany you. Our individual wedding rings are seamlessly forged from a cast at fire and anvil, symbolizing the infinite and boundlessness of your love. Your wedding rings are lovingly handcrafted for you in our forge. At Fire and Anvil we craft precious unique pieces, that are unmistakable in their uniqueness. We are happy to incorporate your wishes and suggestions in the preparation. On request you can have your wedding bands forge with us - if you dare. Wedding rings from the internet? What if they do not fit? Do not worry, we do not have that. After ordering your fancy wedding bands, we send you sample rings made of ordinary steel sizing in the specified dimensions and only when you are sure that they fit, we will start carfting your individual wedding rings. So you avoid nasty surprises on the most beautiful day of your life. We are happy to assist you in the size determination. Can I also watch the rings? We are pleased to welcome you to our lovingly designed Studio in Dinslaken (NRW), Germany. We are happy to take the time to advise you without obligation. In conversation we will advise you about the different possibilities of the variety of patterns. If you prefer the strongly contrasting patterns in your wedding rings, Or are you more the type of noble, finely structured pattern? No problem, every wedding band crafted by us, can be matched to your needs.